When a moderately to heavily contaminated fuel system is treated with an effective biocide, masses of biofilm material – flocs – get suspended into the fuel. As illustrated in figure 1, some of this biomass quickly settles to the tank bottom and the rest is carried with the fuel to the submerged turbine pump. Dispenser filters are designed to capture fuel particulates and biomass flocs. 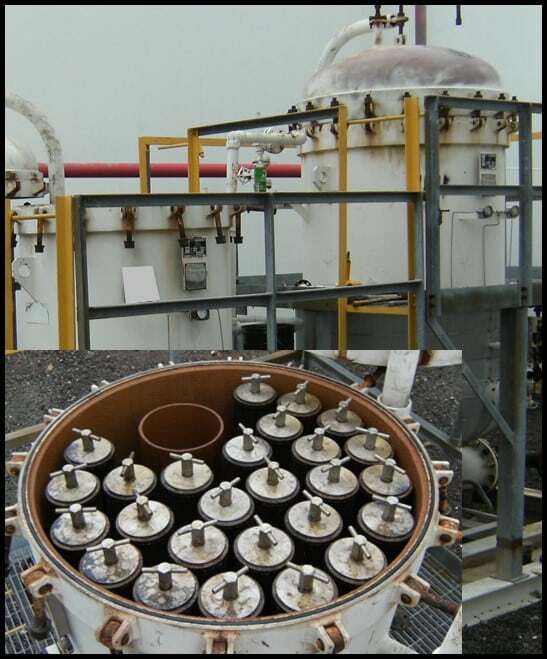 When the fuel is clean, a 10 m fuel filter, mounted in a retail dispenser, can process 500,000 gal (1,900 m3) to a million gal (3,800 m3) of fuel before it needs to be replaced (Note: there are no consensus criteria for filter life. Some retailers replace dispenser filters when the flow is less than 8 gpm – 30 L min-1. Others wait until flow is less than 2 gpm – 7.6 L min-1. In my November 2016 post, I detailed the economics of dispenser flow rates. The opportunity costs caused by slow flow can be startlingly expensive! After a fuel system has been treated, the next step is to get the flocs out of the fuel. Fig 1. 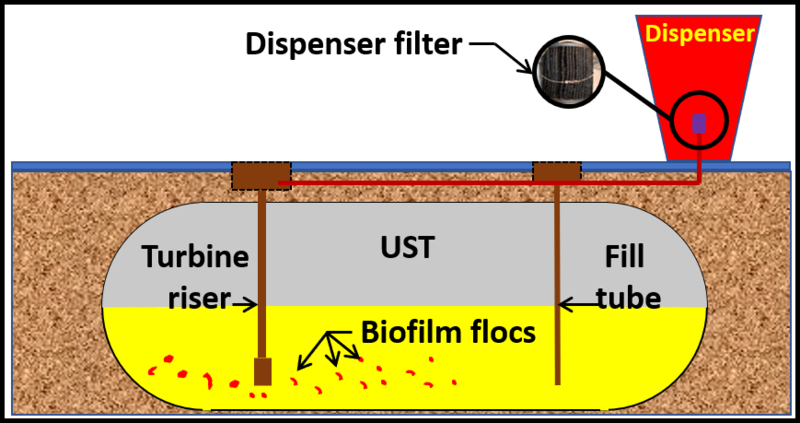 Effect of biocide treatment on biofilm masses – a) photo of the bottom of an underground storage tank – submerged turbine pump is to left, just outside of view so that the left side of the photo is in line with tank’s bottom centerline; b) schematic representation of (a), showing biomass accumulation on either side of bottom-dead center; c) same as (B) but after biocide treatment – biomass flocs are not dispersed in the fuel. There are three options for floc removal. Option 1 is to stop using the dispensers that draw product from the treated tank, give the flocs a day or two to settle to the bottom, and then to vacuum out the bottom sludge, sediment, and water. I can’t think of any retailers or fleet operators who would choose to put a tank out of commission for a couple of days. Option 2 is to let the dispenser filters do all the work. This can translate into multiple filter changes per day for several days (fig 2). When the fuel reaching the dispenser is loaded with biomass flocs, filters can plug after 2,000 gal (7.6 m-3) to 10,000 gal (38 m-3) have flowed through them. This option might be feasible at rural sites that sell fewer than 10,000 gal (38 m-3) per week but is not particularly practical at high volume facilities. Long fuel turnover periods (i.e., more than two days) give biomass flocs time to settle to the tank’s bottom. As is the case for option 1, settled sludge and sediment needs to be removed from the tank as soon as possible after biocide treatment. Optimally, this is done one or two days after the treatment. Fig 2. Removing biomass flocs the hard way – flocs are pulled into the submerged turbine pump and carried to the dispenser filter. As shown in the inset, the dispenser filter quickly becomes covered with slime; preventing fuel from flowing to the dispenser’s nozzle. Option 3 is to use a fuel polishing rig (fig 3). Filtration rigs come in numerous configurations. Filtration rigs come in nearly as many configurations as there are companies who offer fuel filtration services. The number of filter housings on a rig typically ranges from one to three – although there are rigs with more than three housings. Diverse filter media are available – each with advantages and disadvantages relative to the others. Filter housing designs differ by the types and number of filter elements they contain, and by fluid flow patterns they use to optimize filtration efficiency. I’ll leave it to the mechanics and engineers to provide details on filtration technology and rig design. In this post, I’ll describe a generic rig. Rigs with multiple housings use filters in series. Fuel first passes through a coarse filter (for example, designed to remove particles and masses that are >100 m), and then through a polishing filter (nominal pore size between 1m and 5m). Figure 4 shows a 16-element filter housing that’s mounted on a skid. Some filtration rigs include a fuel-water separator. Others rely on coalescer filters to strip water out of the recirculating fuel. Filtration rigs have one or more pumps to drive fuel recirculation. Most commonly, a pump pushes fuel into the tank to create turbulent flow. This turbulence helps to keep particles and biomass flocs in suspension. The pump’s discharge creates pressure and its intake creates a vacuum. The vacuum draws product through the return riser and line to the rig. In fig 3, the pump drives fuel into the tank via a stinger that is inserted into the fill tube fitting and draws fuel through a stinger that is dropped through the turbine riser fitting. The fuel discharge stinger can be rigid or flexible. Some stinger designs include high pressure nozzle meant to source biofilm residual material from tank walls. Depending on how heavily contaminated the fuel is, three to seven fuel-volumes might need to recirculate through the filtration rig to complete the polishing process. Depending on rig design, filtration flow rates range from 75 gpm (0.28 m3 min-1) to 350 gpm (0.9 m3 min-1). For a tank containing 5,000 gal (19 m3) of fuel, this means that post-treatment fuel polishing can take from less than 30 min [(5,000 gal 350 gal min-1) x 3 cycles  23 min] to 8h [(5,000 gal  75 gal min-1) x 7 cycles  470 min  8h]. As I mentioned above, greater flow rate also helps to keep particles in suspension. Fig 3. Removing biomass flocs the easy way – high-capacity filtration rig processes recirculating fuel at 75 gpm to 350 gpm. In this illustration pump pulls fuel through a 3-stage unit (fuel-water separator, coarse filter, and polishing filter) and discharges the filtered fuel – via stinger (in) back into the tank. The pump’s suction also creates sufficient vacuum to draw fuel, water, and particulates from the tank to the rig’s inlet. Using the filtration rig keeps dispenser filters (inset) in pristine condition. Fig 4. High-capacity, two-stage filtration rig – inset shows 26 filter cartridges inside 1st-stage filter housing. My fuel is now clean – is my system also clean? The answer depends what you mean by clean. Periodic microbicide treatment and subsequent fuel polishing can be enough to prevent tank deterioration problems. However, if biodeterioration damage began before the tank was treated and fuel polished, more thorough cleaning might be needed. Even the best fuel polishing equipment can only direct pressure at surfaces that are in direct contact with the fuel. High pressure systems can be used to remotely clean the surfaces of empty tanks. It might be necessary for workers to enter the tank (personnel performing this work must be properly trained and certified to operate in confined spaces) and clean its surfaces manually (fig 5). The only way to know for certain that a tank is clean is by visual inspection. Available remote camera technology can only be used to see exposed surfaces (for example, see: tanknology.com/petroscope. They cannot be used to see surfaces that are below the fuel level. Consequently, for visual inspection by remote camera, tanks must first be emptied (product can be drawn into either a tank truck or frac tank). 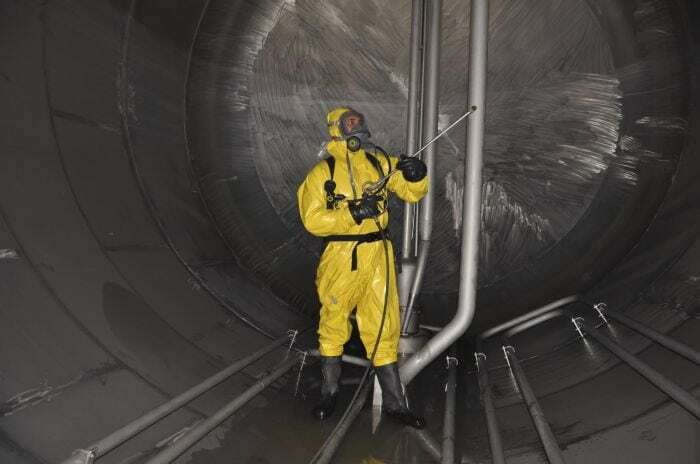 Confined space entry and direct inspection remains the most reliable means of evaluating tanks for cleanliness, coating condition, and corrosion. Why do routine condition monitoring if visual inspection is the gold standard? If direct observation is truly the only way to know how heavily contaminated a tank is, why bother with the various types of tests I’ve described in previous Fuel Microbiology blog posts? The answer lies in return on investment (ROI). Data from routine sample testing (see my December 2016 Blog post provides important infromation about the fuel system’s condition. Most frequently, easy tests that require little or no equipment, act as the canaries in the mine. If results indicate that something is changing for the worse, more advanced tests help to determine what is going on. One can run routine tests and complete preventive maintenance actions for years for the cost of a single visual inspection. Consequently, internal inspections are reserved for when data (or regulatory ordinances) indicate they are needed. For more information about detecting and controlling microbial contamination in fuel systems, please contact me at fredp@biodeterioration-control.com.